Inventor and engineer Murthy Tata talks about the invention that made him an unlikely coffee leader, the NitroBrew. You probably don’t see a lot of coverage of engineers here, but at Barista Magazine we want to expand the coffee community and share stories from a wide variety of its members. We’ve covered the NitroBrew, the device that allows you infuse nitrogen into any drink one cup at a time, on this blog before. Now, we sit down with the inventor, Dr. Murthy Tata, to talk about the intersection of coffee, science, and the how his passion for food and drink led him to invent the NitroBrew. Ashley Rodriguez: What was your first experience with coffee? Murthy Tata: I was probably 8 or 9 years old when my grandma filled milk in a glass that had a little coffee in it and gave it to me. I remember initially complaining about having to drink ‘contaminated’ milk. But to my surprise, it tasted better than usual milk. Over the years coffee replaced more and more of the milk. AR: Have you always had a knack for inventing things? MT: I am always tinkering. Thankfully, I was able to follow through on some of my projects, including NitroBrew and put them out in the marketplace as mature products. I usually take an unconventional approach to familiar problems. We are known for our innovative and novel solutions at QuantiPerm (a company I started in 2003 with products in food and beverage, biotechnology and brewing industries). Murthy is the founder of QuantiPerm, and has since opened a separate branch to respond to the popularity of NitroBrew. AR: What inspired you to invent the NitroBrew? MT: Inspiration for the NitroBrew idea comes from my career in the brewing industry. Nitro-style beers, in my opinion offer an amazing drinking experience with a silky-smooth texture, and a very different way of presenting flavors. I developed a process to infuse nitrogen for Leinenkugel Brewing during the early 1990s. It turned out to be an amazing beer called Creamy Draft. People just loved it. But after the initial excitement, we learned that the customer experience didn’t work out the way we had imagined. We learned quickly that no matter how great your nitro style beer is, maintaining a consistent quality throughout the distribution system and at the bars was going to be a very difficult proposition. With these beers, unlike the normally carbonated beer styles, any changes in temperature, beer gas composition or pressure changes at retail adversely affect the quality. How many times have you had a nitro beer at a bar that had no head of foam? That was disappointing. Infusing coffee with nitrogen is a more recent phenomenon. Initially, I was skeptical. I reached out to some specialty coffee folks around here to learn about how to do nitro coffee and experimented with a few of their coffees. It was a learning experience. We learnt that the coffee variety and the roasting style may either go very well or not so well with the typical beer gas infusion. The carbon dioxide levels in the gas can impart really astringent taste for certain styles, although the effect can be mostly overcome for certain styles when you use sweeteners, flavorings, or cream. 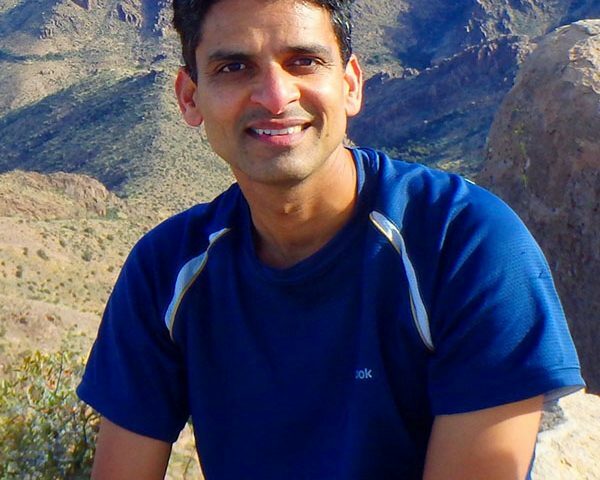 Murthy is an avid outdoorsman, and enjoys rock climbing, sailing, and running. AR: What type of coffees do you enjoy on the NitroBrew? MT: I like all varieties. That said, low-acid, medium roast varieties are my favorites. While almost all of these styles work amazingly well with NitroBrew, many of them don’t even need to be cold-brewed. Often at home, I just collect my drip coffee onto ice and NitroBrew it right away. AR: What other jobs have you had? How did you get to this point? MT: I am a chemical engineer. I had a brief stint in the petroleum industry. After graduate studies in biochemical engineering, I went to work in the brewing industry R&D for several years. I worked in all areas: fermentation, brewery processes, and also a little in chemistry of beer. Later I also worked in beer packaging and had the technical responsibility for putting beer in plastic bottles for the first time in North America. I accepted an invitation to work in Motorola’s Biochip development business in Arizona where we were developing chips to study gene expression profiles in biological samples. I founded QuantiPerm in 2003 producing R&D instruments on a technology I patented (for rapid, nondestructive testing of packaging materials). QuantiPerm diversified its product offerings over the years to include carbonation systems, dissolved gas analyzers, bioprocess monitors, water treatment systems, etc. NitroBrew happens to be one of the recent QuantiPerm products, and since it caters to a different market, it was spun off as a separate company in 2014. Murthy cites being outdoors as his way to relax. AR: Are you working on any other projects? Any other ways to improve coffee? MT: We are eager to finish up some projects relating to fermentation monitoring and control systems for both commercial breweries as well as the home brewer market. In general, we don’t like to launch into a product line unless we feel like we can make a strong contribution. In the coffee realm, we had been asked about kegerator-style in-line nitrogenation systems and we are looking into the possibilities and are working with larger commercial partners. AR: What do you want people to know about you? MT: As a consumer, I am very demanding of what I buy. So as an entrepreneur, I strive to offer the finest products that our customers are thrilled about. This is something the entire crew here strives to provide to our customers. Today, more than ever, it is our customers that come up with amazing and creative drinks. It is an entirely new level of satisfaction whenever our customers share their creations that include NitroBrew. I draw inspiration from my family, friends, colleagues, and also our customers. I feel awed by the fact that all these amazing people share a part, however small, of their lives with me. While money can be important, I derive most pleasure from doing the little things everyday that make a difference. Murthy and his wife, Sabitha. My wife Sabitha, is a source of stability and inspiration. She and both my kids let me be a kid myself in my interactions with them and for that, I am forever thankful.